You can get battery operated LED ‘puck’ lights, strip lights, lights on a gooseneck, and all sorts of other innovative lighting solutions. The FLEXIT light (says its at Home Depot stores) puts a bunch of LED’s on a flexible pad with a magnetic base that holds 3 AA batteries. That allows spreading the light out a bit as well as shaping the light source for a particular need. You can also see the variety when browsing through the big retail outlets. You can get LED lights designed as replacements for the common light bulbs in your RV. There are even models designed to replace fluorescent tubes. These tend to be rather expensive. If you have a bit of a do-it-yourself bent and some creativity, you might be able to supplement your RV lighting with LED’s without too much effort. One way to do this is to get a 5 meter (16 foot) reel of LED lights and go to town. These LED strip lights are very common and provided in many varieties with costs running from a bit over $10 to more than $100. The LED strip lights are long flexible circuit boards with an adhesive strip on the back. They are usually configured as 100 separate 12v LED light circuits. You can cut the strip between the light circuits to configure how you want to make your light source – from 100 small lights to one long light source. The typical 3258 SMD (surface mount device) strip circuit used in these has three white LED’s that drop the voltage about 3.4 volts and a 150 ohm limiting resistor. At Amazon – HitLights LED Flexible Lighting Strip Cool White or Bright White, 5 Meter or 16 Ft, 3528 Type, 300 SMD, 24 Watt (sponsored link – new idea here being tried out!) is a $14 item that has a clip for a coaxial power connector. A strip of LED’s like this has a total light output just about on par with that of the typical 2 bulb T-8 18 inch fluorescent fixture used in many RV’s. For household use, you need a 12v power supply. One $38 offering that includes both the power supply and a dimmer is 5 Meter Reel Warm White 3100k Flexible LED Ribbon 300 Leds 16 Ft with Free Dimmer and Free Transformer By Ledwholesalers, 2026ww-31k. You can use the dimmer in your RV 12v system. The simple LED light control for ~$7 is PWM Dimming Controller For LED Lights or Ribbon, 12 Volt 8 Amp, 3301. The whizbang version with a remote control $11 – PWM Dimmer for LED Lighting with 12 button Wireless Remote 12 to 24 Volt 6 amp, 3317-DM. These dimmers use PWM or pulse width modulation just like a lot of solar charge controllers. note: SierraNevadaAirstreams.org is a participant in the Amazon Services LLC Associates Program, an affiliate advertising program designed to provide a means for sites to earn advertising fees by advertising and linking to Amazon. — check the links and you help support the website. Several tests have been run with inexpensive LED strip lights – pictures to show color differences and how a camera adjusts for light output will be provided soon. Into fossils? Death Valley? Maybe guitar recordings? Check out the Fossils in Death Valley National Park website. It is another one of those ‘busy’ pages with a lot of pictures and a lot of information. Check it out. 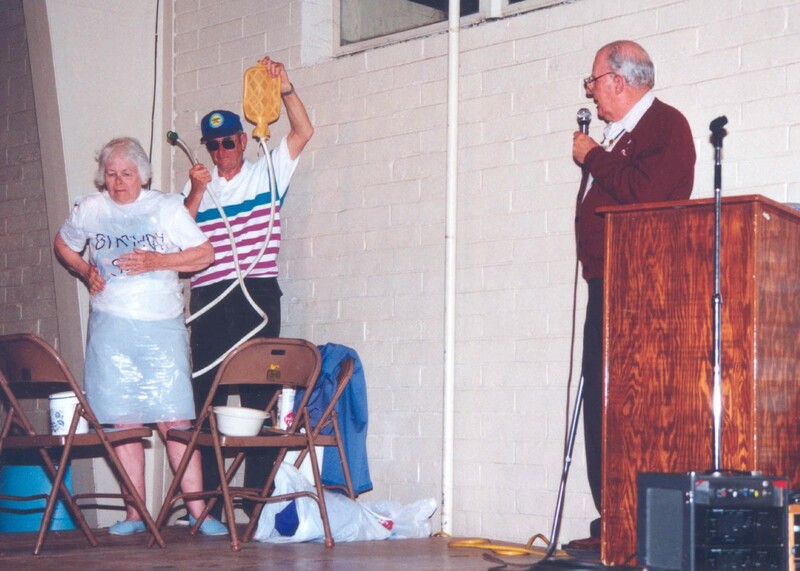 Dale and Virginia Leipper did a skit at a Monterey Bay Unit rally about how to take a shower with minimal water use. It was so funny and such a hit they were asked for a repeat performance at the March 1994 Region 12 Rally in Los Banos, CA. For this performance MBCU member Joe Gorman assisted. See the web page in travelogues.